Who needs a Nintendo Wii when you’ve got an iPhone? The Social Gaming Network, which released a Wii-like golfing game for the iPhone two weeks ago, has now followed up with a bowling game. 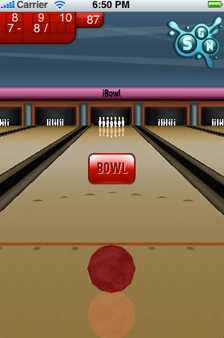 As with iGolf (which has already been downloaded more than 900,000 times), iBowl uses the iPhone’s accelerometer to detect a player’s swing. You can twist your wrist to give the ball spin or direct it to the pins.